I was up early on Saturday morning for the New Zealand Chocolate Festival! I arrived well before the doors opened, but there was already a crowd waiting eagerly outside! Waiting to Get in to the New Zealand Chocolate Festival! After having a good look around the stalls and exhibits, I settled on my two favourite chocolate-related businesses for 2012: RQute Chocolates and Lavage Soaps! 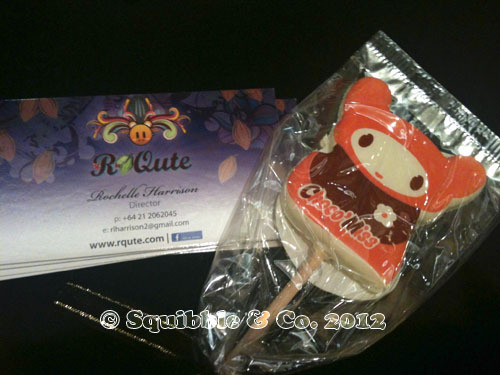 RQute by Rochelle Harrison is a line of chocolate with bright colours and graphics. I saw this ‘Choco Miss’ lollipop and bought it on the spot! My other amazing find is not made of chocolate, but looks and smells just as delicious! Jayne Lapin from Lavage makes an amazing range of soap that looks and smells just like real cakes, confectionary, and chocolate! I bought a rainbow bar soap and a Chocolate Frog soap. The Chocolate Frog looks so realistic that it even has a label on the back stating that it is soap and not food! In other news, Squibble & Co. has two exciting events happening in September! This Friday is the opening of the Nature: Art + Design Gallery in Auckland. I will have selected designs on display there for the next twelve weeks, including new unique designs! The other exhibition I will be taking part in is the Second Time Around Exhibition at Matchbox Studios in Wellington. Squibble designs will be re-created using only recycled and upcycled components. I am really excited about the pieces I have created so far, and have enjoyed the opportunity to research and explore new methods! “Second Time Around” is an exhibition/market/pop-up shop where everything is made from recycled, re-purposed or waste materials!Sept 11th – 23rd 2012 Wellington, NZ! I will be updating the blog with market dates for September soon, so stay tuned, and as always stay crafty!